Happy Latte’s High Noon is a shooting game that turns your device into a gun, allowing you to aim and shoot at your enemies with the tilt of a wrist and a tap of a finger. A drawback to this type of gameplay is the fact that sometimes you literally have to tilt your body in order to sight your opponent. Although this does bring an element of realness to the game, it becomes irritating as struggle to aim your gun. But once you master being able to sight your opponent, the game is rather fun. High Noon is set in the old wild west, where laws are mere suggestions and everyone seems to have a bounty on their head. The goal of the game is to challenge these outlawed men to a duel in order to collect their bounties. Earn enough gold and you can start shopping in the different stores available in town, ranging from the general store to the Indian trading post to the gun shop. This allows you to customize your character and upgrade your weapons as you go after the worst of the worst. Once you’ve familiarized yourself with your gun in the practice round, pick an opponent from the line up and challenge them to a duel. To really bring home the fact that your device is your gun, you have to holster your gun before the duel can begin. This means lowering your device down to your wide and waiting for the signal before you can lift your “gun” and start firing. Once you’re given the signal, do your best to take out your opponent before they take you out. Since you start off with only a revolver, there are only six shots in the gun. To reload, you must tilt your device forward like you would with a real gun to open up the cylinder and tap on the gun to reload. Then tilt your device back up to snap the cylinder back into place and start shooting again. When you’re not dueling, you can also steal from your opponents–just hope that you don’t get caught. 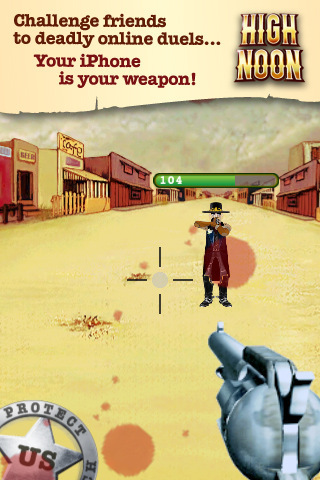 The first level of High Noon is played against the computer but once you’ve moved on to the second level, you can start challenging and receiving challenges from real players around the world. This is when customizing your character is a good idea since it’ll set you apart from the other players in the game. Otherwise you’d look just like all the other players who decided not to customize their character’s outfit. Happy Latte seems to have designed High Noon based on the shooting galleries at carnivals. Your opponents flip and turn like cardboard cut outs rather than like real people, and the music and dialogue is just as cheesy and amusing. But just like those shooting galleries at the carnival, aiming and shooting your gun can be a bit of a challenge when you’re required to actually move your body while playing the game. This was a rather interesting experience for me since it was the first time I’ve had to do such a thing. But once I caught on how to aim and shoot, High Noon became very fun. There is a vicious joy in challenging real people to a gun fight–even if it’s only a game. 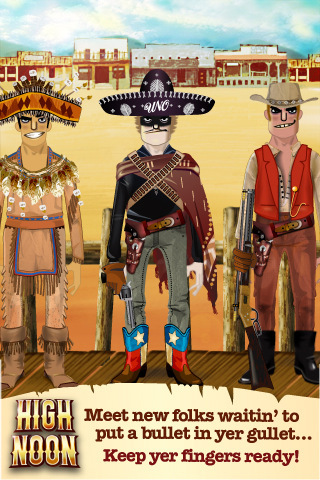 AppSafari review of High Noon was written by Julie Guan on July 13th, 2011 and categorized under Action, App Store, First Person Shooter, Free, Fun, Games, Physics Based. Page viewed 8652 times, 5 so far today. Need help on using these apps? Please read the Help Page. This is one of my favorite games. Its free, but spend some bucks for extra wampum. I love the music and the way you actually ‘draw’ your iphone in order to begin shooting. Allows you to place players on your Sh*t list (that’s what they call it) an you can also ‘telegraph’ them messages. The app offers daily prizes if you sign into everyday. Great outfits and accessories to dress your player. My only issue is that there is nothing for us Cowgirls. I hope they update that one day…cause I’m killing the guys like there is no tomorrow and I want them to know they got that from a girl!